Plenty of egg yolk and the best sunflower oil make this delicacy mayonnaise to a premium product. 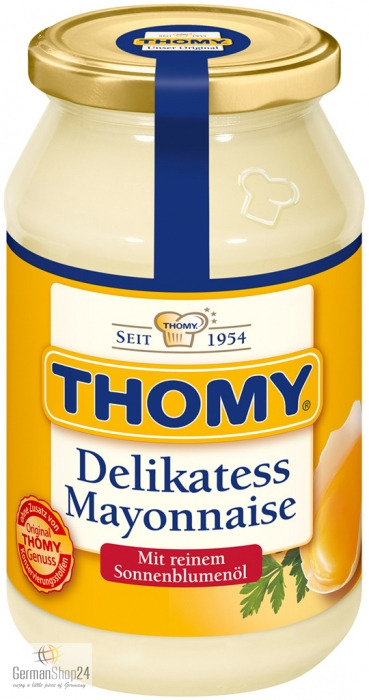 The Thomy mayonnaise captured the hearts of the Germans since already 60 years. Plenty of egg yolk and the best sunflower oil make this delicacy mayonnaise to a premium product. With sensuous mayonnaise taste in potato or noodle salads it even pampers the culinary connoisseurs to the finest. 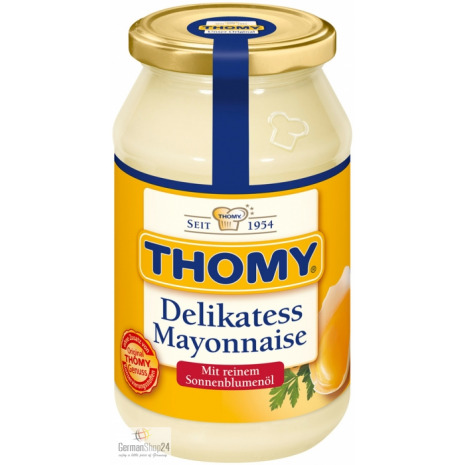 For the pure taste, Thomy deliberately avoids preservatives, flavor enhancers and artificial colors. 16.9 fl. oz NET. WT. 80% sunflower oil, vinegar, 6.2% EGG YOLK, MUSTARD SEEDS, sugar, iodized salt, spices, natural flavoring (with CELERY, MUSTARD). 80% Sonnenblumenöl, Branntweinessig, 6.2% EIGELB, SENFKÖRNER, Zucker, Jodsalz, Gewürze, natürliches Aroma (mit SELLERIE, SENF).